Michael Faraday discovered electro-magnetic induction in August 1831. He proved that electro-magnetism can produce electricity, and along the way he invented the electrical transformer. Photo of Michael Faraday's original generator apparatus, courtesy of the Royal Institution, where Faraday did his experiments. Having discovered electro-magnetic induction, Michael Faraday went on to explore its effects. He had discovered that electro-magnetism produces electricity, now he wanted to find out if magnetism and motion combined could do the same. Faraday had discovered electro-magnetic induction in August 1831. Just a few months later, he successfully conducted the experiment that demonstrated the relationship between magnetism and motion. He passed a magnet in and out of a cylindrical helix wound with wire and showed that electricity was produced. 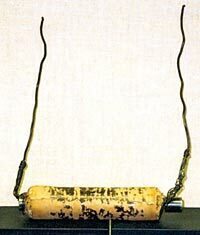 A tube of any fairly neutral material  cardboard would do  is wound with a coil of copper wire in much the same was as it was for the transformer experiment. That is, the windings do not touch and they are wrapped together with cotton wadding to insulate them. Passing through the tube is a magnet in the shape of a rod  the one illustrated has a wooden handle for convenience. The dashed grey lines indicate the (invisible) magnetic field of the magnet. They are a scientific convention for showing lines of magnetic action (force lines). All magnets have a magnetic field. The north and south poles of the magnet are also indicated. Each end of the copper wire is connected to a galvanometer, an instrument that detects current. The wire is now a continuous loop, and if electricity is generated in it, the needle on the galvanometer will move to indicate its presence. The next diagram shows the experiment in action. 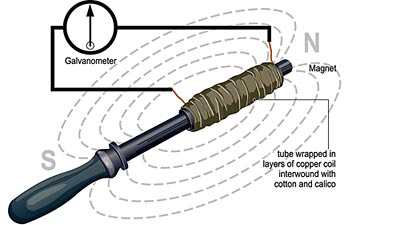 When the magnetic rod is moved backwards and forwards inside the tube, which remains stationery, the needle of the galvanometer leaps into action, registering current. 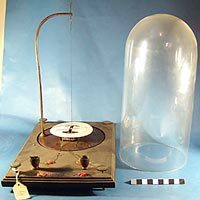 If you substitute a lamp of some sort for the galvanometer, you can use this apparatus to light it up. As the magnet moves, the lines of magnetic force repeatedly intersect with the wire. This excites the electrons in the wire, generating electrical current. Faraday's devise is a simple dynamo (dynamo-electric machine) and the first electrical generator. Virtually all electric power is produced using this principle, no matter whether the prime source of energy is coal, oil, gas, nuclear, hydro, wind, etc. The fuels are used to drive a generator (or turbine) which generates the electrical current. For more on large scale power generation, see supplying electricity and an electrical conversation. The experiment also demonstrated that it was essential for magnetic induction that the conducting circuit must intersect the force lines of the magnet. 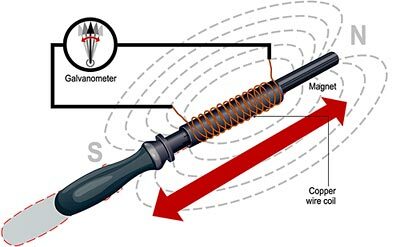 That is, the wire coil in the experiment had to be inside the magnetic field of the magnetic rod. At the time of the experiment, Farady used the word field in the purely descriptive sense but he went on to explore magnetism further  eventually showing that it is a universal property of matter  and laid the foundations for what we call today electro-magnetic field theory. The apparatus we used for our illustrations is shown above. It's a recreation of Faraday's device made by the Royal Institution. You can clearly see the magnet, tube and cotton wadding, though the copper wire coil is hidden. The two ends of the coil are joined on the surface of the wadding with small lamps included in the circuit. When the magnet is pushed back and forth, the lamps light up.